Shane Carruth, despite having made just two features, can already be labelled a divisive director. 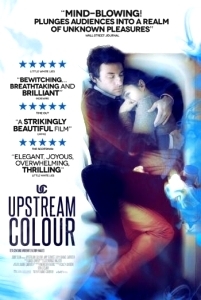 His latest think piece, Upstream Colour (2013), is a complex examination of the mutability of identity. Since its debut at the Sundance Film Festival (where it won the Special Jury Prize), it’s been both lauded and derided – latterly because of a sense of alienation (or even coldness) that the film may have engendered. However, delve a little deeper and Carruth’s latest reveals itself to be a finely portrayed emotional powerhouse, imbued with an understanding of the fragility of modern personhood, realised with breathtaking precision. Part-inspired by Henry David Thoreau’s Civil Disobedience, Upstream Colour is wrapped in a disorientating blanket of science fiction, full of psychotropic drugs and telepathic pigs that – like Carruth’s debut Primer (2004) – pushes the limits of narrative cinema in exciting new directions. At the heart of this hypnotic delight are Kris (Amy Seimetz) and Jeff (played by Carruth himself), a distant couple who discover that they’ve become pawns in a twisted scientific experiment conducted by a mysterious audio enthusiast and part-time pig farmer (Andrew Sensenig), shattering all their natural preconceptions. Suitably, the true beauty of this labyrinthine work can be found in its enigmatic, enriching complexity. Carruth has stated several times over that he would encourage viewers to watch and re-watch his new film in order to strip back its many layers. It’s certainly sage advice, as there will be many who find Upstream Colour utterly perplexing. For others, on the other hand, it serves as a bracing palate-cleanser to the throwaway cinema that has populated the multiplexes in recent months. Indeed, it can be a challenge to look past the film’s handsome, dreamlike aesthetics. Beyond lies the visual equivalent of a musical ear-worm that, try as you might, fails to be shaken out of your subconscious, lingering in the psyche and compelling you to revisit again and again. One reason Upstream Colour is so utterly compelling can perhaps be found at its core; namely, the love shared between Kris and Jeff. This is a love so powerful it resembles a drug addiction, a dependence that’s contingent with a perceived form of existence, an immutable yearning and sense of connection that’s almost inexplicable. Far from impenetrable, but certainly challenging, the emotional resonance of the characters is effective as well as affecting, as they experience their lives reduced to its most fragile elements. Carruth, once a software programmer, shows a near-autistic capacity for distilling emotion into a finely-structured, rich and rewarding cinematic experience.